Our work in Guinea focuses on supporting new approaches to natural resource management. Guinea has exceptional mineral wealth, yet its people are amongst the poorest in West Africa. Guinea has a population of 12.6 million people, and nearly three quarters is living in poverty, with a lack of education, health, and adequate living standards. Corruption, political instability, and poor infrastructure have limited Guineans ability to benefit from their natural resources. Past conflict and insecurity have resulted in resource mismanagement and impacted development. Agriculture is the main pillar of Guinea’s economy, employing more than three quarters of the labour force. Meanwhile, the mining sector provides more than a quarter of the state’s revenues, and hundreds of thousands of Guineans participate in artisanal mining. Guinea is a member of the Kimberley Process and is required to put in place internal controls that certify the origin of its rough diamonds as conflict-free. Despite being a member of the KP, the country still struggles with the illicit trade of diamonds and other minerals, losing important tax revenue. It is a member of the Regional Approach for the Mano River Union, collaborating with its neighbours Côte d’Ivoire, Liberia, and Sierra Leone to strengthen KP compliance. Guinea has one of the world’s largest bauxite reserves, accounting for more than a quarter of known global reserves. Other key natural resources include iron ore, diamond, gold, uranium, water, and fish. Our research in West Africa investigates the drivers of the illicit trade of conflict-prone natural resources and highlights recommendations for the region’s countries, including Guinea. We examine issues such as formalization of the artisanal mining sector, fiscal reform, harmonization of legislation, and strengthening of internal controls to end smuggling. We also provided analysis of certification, traceability, and due diligence as it applies to diamonds and gold in the region. As part of our work to transform mineral supply chains, we’ve led efforts to support KP internal controls and due diligence, while promoting benefits for Guinea’s miners and their communities. We are member of the technical team supporting the KP Regional Approach for the Mano River Union, assisting the development of a strategy to address the illicit trade of diamonds and KP compliance. We share best practices on diamond governance and provide capacity building to Guinean stakeholders, including policymakers, private sector, and civil society actors on the implementation of KP internal controls and OECD Due Diligence Guidance for Responsible Supply Chains of Minerals from Conflict-Affected and High-Risk Areas. Through our collaboration with the KP Civil Society Coalition, we provide support to our partner in Guinea to participate in the KP, as well as support and spotlight their capacity for independent monitoring of traceability and due diligence in the natural resource sector. We drive dialogue with our partners in Guinea, including policymakers and the private sector to implement due diligence and improved traceability as well to ensure benefits reach miners and their communities. Through our partnership with the KP Civil Society Coalition, civil society from Guinea and West Africa brings the voices and concerns of artisanal miners to industry and governments. Together, we engage governments to strengthen their internal controls, and encourage the private sector to put in place traceability and due diligence for their mineral supply chains. 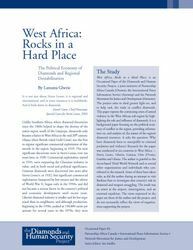 This report traces the development of Guinea’s diamond industry and discusses the devastating attacks by Sierra Leonean rebels in 2000 and 2001, arguing that the objective was part of a wider scheme to destabilize the region and to further Liberian President Charles Taylor’s regional economic ambitions.